Sam Houston Futurity(G2) winner Ivan James is the 2015 Sam Houston Race Park Horse of the Meet. HOUSTON, TX�MAY 20 2015�The 2015 Sam Houston Race Park Quarter Horse Meet concluded on Saturday, May 16 with live racing and the simulcast of the thrilling Preakness Stakes. Ivan James, a 2-year-old colt bred and owned by Jorge Meraz, was named 2015 Horse of the Meet. The talented juvenile made his career debut in trials for the richest race of the season, the $621,100 Sam Houston Futurity (G2). The son of IVORY JAMES out of the Dashin Bye mare First Dashin Bye recorded the fastest time in trials under Raul Ramirez, Jr. On April 25, the bay colt returned in fine form for the final, led gate-to wire, before drawing off to a 1� length victory. He covered 330 yards in :16.701, faster than his maiden-breaking trial win in 16.748. Trained by Angel Sanchez, Ivan James now posts a perfect two-for-two career record and earned $248,440 for the winner's share of the richest purse in the history of the Sam Houston Futurity. Meraz is very proud of his homebred and pleased that his was honored by Sam Houston Race Park. "I thought he would be a good horse as his mama, First Dashin Bye was very special," said Meraz. "When we sent him to Houston in February and he had that work on that cold, rainy day, we saw his potential." The owner appreciated the confident handling by Ramirez and the excellent care he has received from Sanchez. "Angel is an excellent horseman," added Meraz. "He has a great team and they work very hard. He and Jose as well as the rest of the team have done a great job for us." 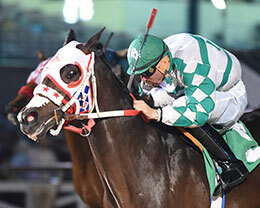 Meraz confirmed that Ivan James will compete in the Firecracker Futurity at Delta Downs (trials on June 13) and return to Texas for the Texas Classic Futurity at Lone Star Park. In addition to being honored by Sam Houston Race Park, Ivan James has earned national recognition in the 2-year-old AQHA Racing-Horseplayernow.com Top Ten Poll. "We congratulate Mr. Meraz for the accomplishments of Ivan James," said Fred Hutton, Sam Houston Race Park racing secretary. "This was an exceptional season with many talented stakes winners that will make an impact throughout the year in Quarter Horse racing."